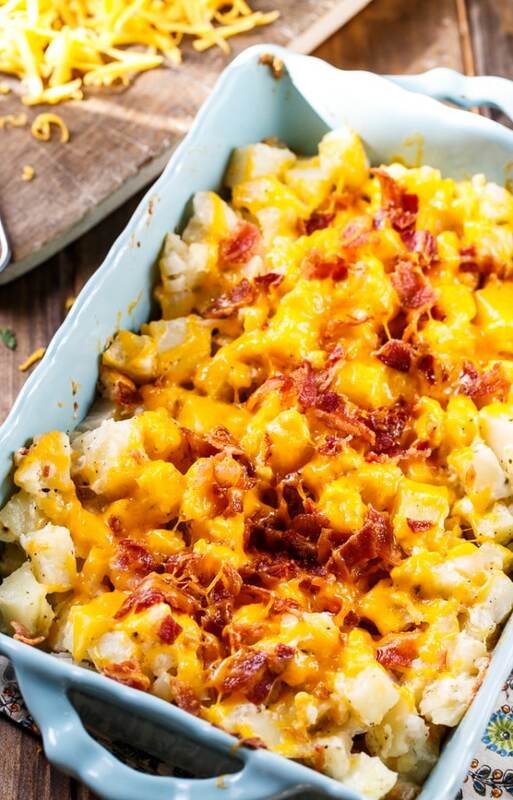 Cheesy Bacon Ranch Potatoes is the ultimate potato side dish. 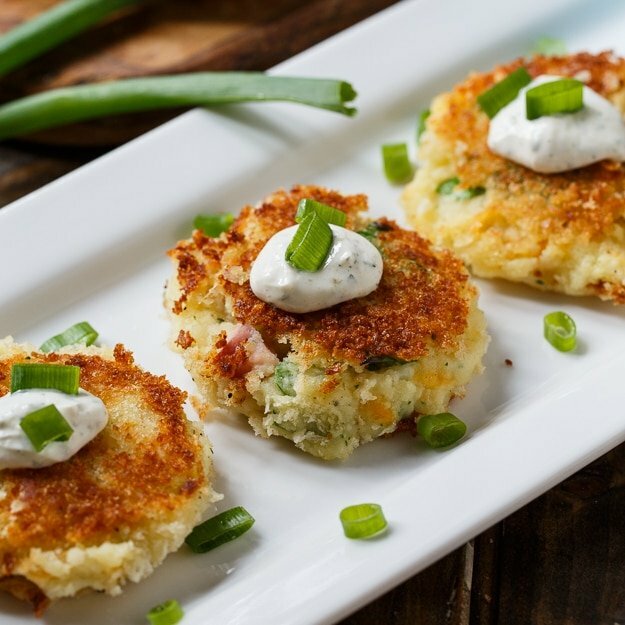 Who can resist the combination of cheese, bacon, and ranch? It’s pure comfort food that everyone will enjoy. Potatoes are hard to get cooked through all the way in the oven, so to make sure they are plenty hot, I simmer them in salted water until they’re starting to soften, but they’re not quite all the way cooked. Transfer it to a casserole dish, cover it with aluminum foil, and bake for 25 minutes. Uncover and sprinkle with more cheddar and bacon. Pop it back in the oven until the cheese is melted and gooey and get ready to dig in. With a side dish this good, who even cares what else is being served? 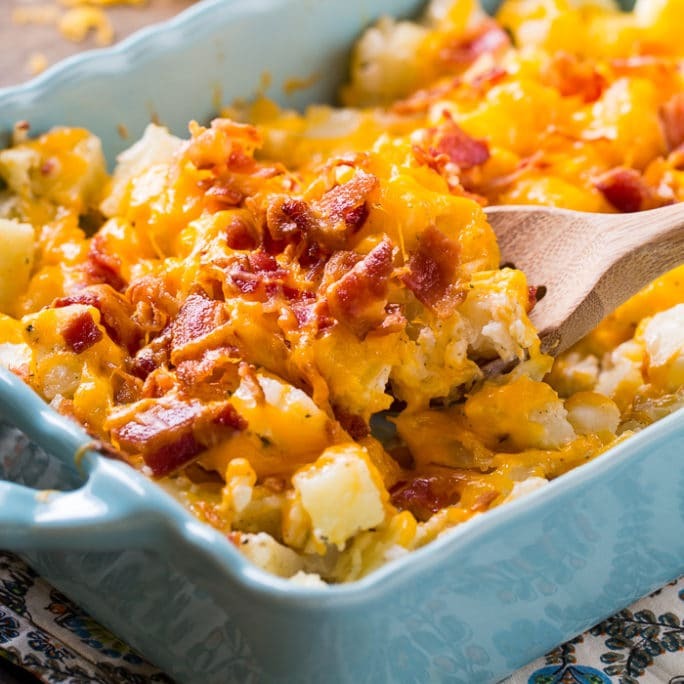 Cheesy Bacon Ranch Potatoes are full of cheese, bacon, and Ranch seasoning. It's the ultimate potato side dish. Place potatoes in a pot and cover with water. Add 2 teaspoons of salt. Bring to a simmer and simmer until just barely soft, about 10 minutes. Drain well. In a large bowl, stir together mayonnaise, Ranch mix, and cream cheese. Stir in potatoes, onion, pepper, and 1 cup shredded cheddar. Stir in 1/2 the crumbled bacon. Taste for seasoning and add salt if desired. Transfer to a 9X13-inch greased baking dish. Cover with aluminum foil and bake at 375 degrees for 25 minutes. Remove foil, sprinkle remaining cheese and bacon on top and bake uncovered for 10 minutes. This entry was posted in Casseroles, Side Dishes and tagged bacon, potatoes, ranch. Bookmark the permalink. Can I use ranch dressing if I don’t have dry ranch? This is similar to the slow cooker version I found on Facebook, I’m gonna add chicken and take out the mayo and cream cheese, reluctantly since I don’t have enough, to make it tonight hopefully blending your version with the other will yield an edible dish ha! I made this recipe as written and I was disappointed. Do you think you could microwave the potatoes instead of boiling? I have never tried that Rachel. Yes, you could use either yogurt or sour cream. Wow, ingredients combined into one. I love this. You will have to leave them in the oven a lot longer if you don’t boil them first. What do I preheat oven to? Could you add chicken and broccoli to this to turn it into more of a main course? Yes, you could definitely do that. I think it would be delicious! Can these be frozen and made ahead? I’ve never tried freezing them ahead of time so I’m not sure how it would turn out. Made these for my daughter’s birthday. Yum and double yum! Thank you for sharing! Can YUKON potatoes be use in this? yes, you can use Yukon potatoes. 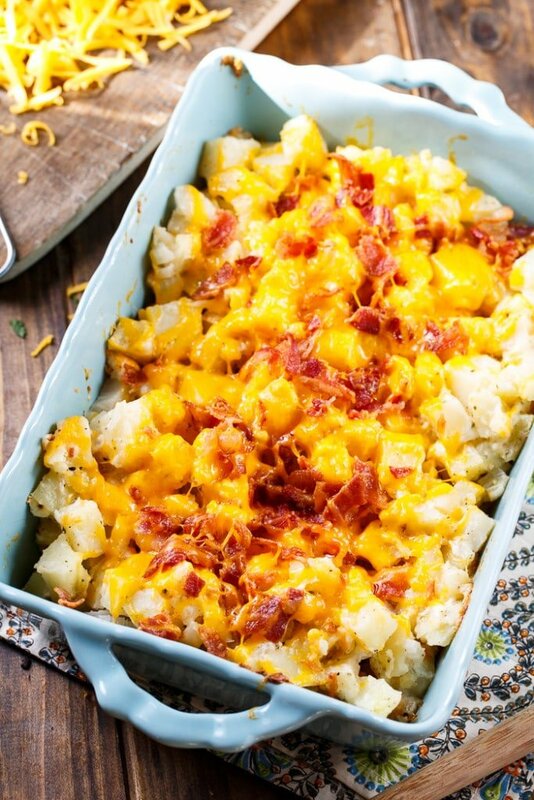 What a perfect, cheesy potato dish! 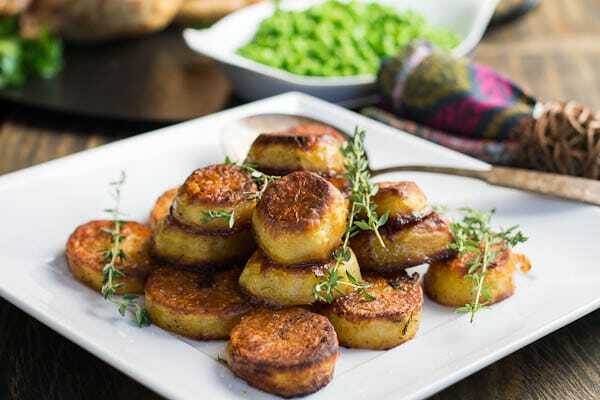 These potatoes are sure to be a hit with my family! This is a baking dish full of comfort food — no doubt about it! I’d be happy just eating these alone! Ultimate potato side dish is right! Bacon, ranch and loads of cheese?!! GAHH! YAAAHHS! Totally drooling over here! I want to throw an egg on this and call it breakfast! 😉 Cheers, friend! Oh yes, this definitely looks like the ultimate potato side dish! So much cheesy goodness and I love the addition of the ranch and bacon. 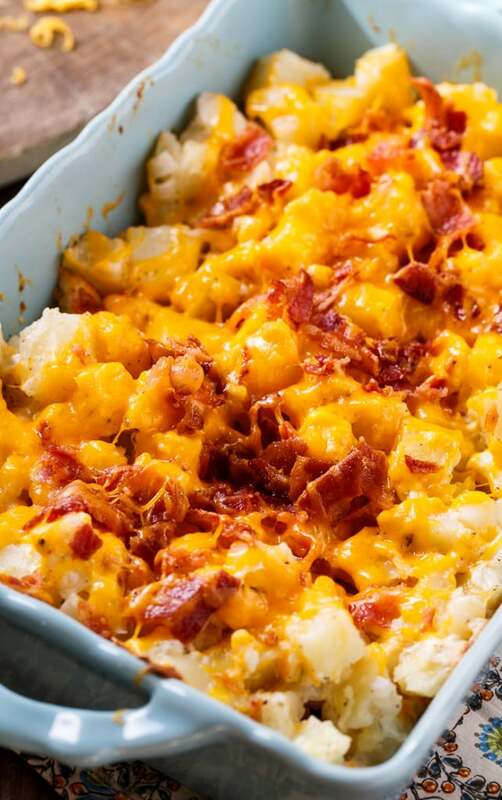 Cheesy potatoes are ALWAYS a huge hit with my family, but throwing bacon and ranch into the mix too?? This is pure comfort food. 😀 Love it! Oh all of my favorites ingredients combined into one…love this, Christin! I think I could make a meal out of these potatoes. Looks just perfect!